The KFGD series gravity grading destoner is modern equipment used to continuously grade and separate stone from wheat and other grains, beans, and corn. 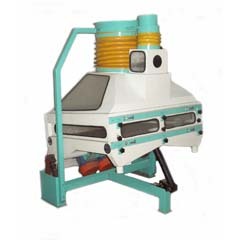 Through pneumatic separation within the grain cleaning machine, fine impurities such as buckwheat, grass seed and dust can be separated from grain. With a high capacity, low noise, and low dust emissions, the grain destoner features convenient operation and simple maintenance. The grain destoner needs substantial aspiration capacity, so a single aspiration channel should be well equipped.